For the DART Light Rail station at the airport, see Dallas/Fort Worth International Airport station. For the nearby Trinity Railway Express station, see CentrePort/DFW Airport station. Not to be confused with Washington Dulles International Airport. Dallas/Fort Worth International Airport (IATA: DFW, ICAO: KDFW, FAA LID: DFW) is the primary international airport serving the Dallas–Fort Worth metroplex area in the U.S. state of Texas. It is the largest hub for American Airlines, which is headquartered near the airport. It is the fourth busiest airport in the world by aircraft movements and the fourteenth busiest airport in the world by passenger traffic in 2017. It is the ninth busiest international gateway in the United States and second busiest in Texas. With nearly 900 daily flights, American Airlines at DFW is the second largest airline hub in the world and the United States, behind Delta's Atlanta hub. Located roughly halfway between the major cities of Dallas and Fort Worth, DFW spills across portions of Dallas and Tarrant counties, and includes portions of the cities of Irving, Euless, Grapevine and Coppell. At 17,207 acres (6,963 hectares; 27 square miles), DFW is larger than the island of Manhattan, and is the second largest airport by land area in the United States, after Denver International Airport. It has its own post office ZIP code, 75261, and United States Postal Service city designation ("DFW Airport, TX"), as well as its own police, fire protection and emergency medical services. The members of the airport's board of directors are appointed by the "owner cities" of Dallas and Fort Worth, with a non-voting member chosen from the airport's four neighboring cities on a rotating basis. As of April 2019, DFW Airport has service to 249 destinations, including 62 international and 187 domestic destinations within the U.S. In surpassing 200 destinations, DFW joined a small group of airports worldwide with that distinction. 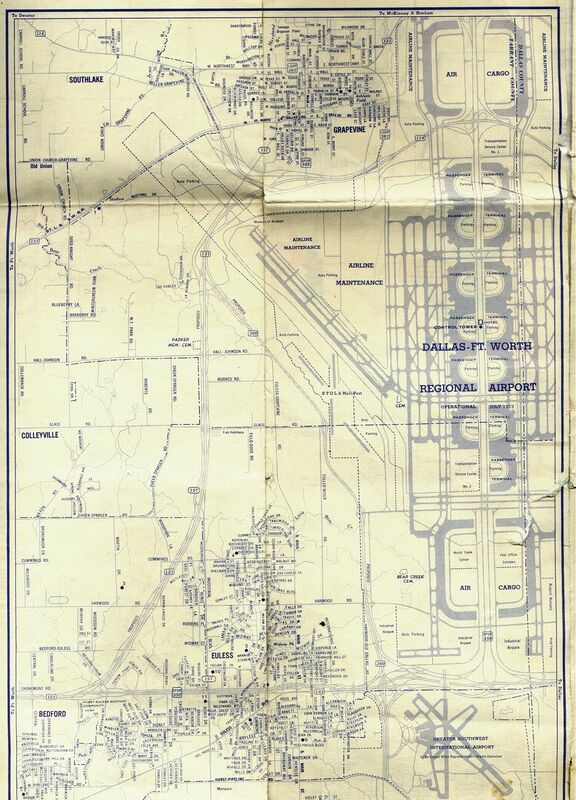 As early as 1927, before the area had an airport, Dallas proposed a joint airport with Fort Worth. Fort Worth declined the offer and thus each city opened its own airport, Love Field and Meacham Field, each of which had scheduled airline service. In 1940 the Civil Aeronautics Administration earmarked $1.9 million for the construction of a Dallas/Fort Worth Regional Airport. American Airlines and Braniff Airways struck a deal with the city of Arlington to build an airport there, but the governments of Dallas and Fort Worth disagreed over its construction and the project was abandoned in 1942. After World War II, Fort Worth annexed the site and developed it into Amon Carter Field with the help of American Airlines. In 1953 Fort Worth transferred its commercial flights from Meacham Field to the new airport, which was 12 miles (19 km) from Dallas Love Field. In 1960 Fort Worth purchased Amon Carter Field and renamed it Greater Southwest International Airport GSW in an attempt to compete with Dallas' airport, but GSW's traffic continued to decline relative to Dallas Love Field. By the mid-1960s Fort Worth was getting 1% of Texas air traffic while Dallas was getting 49%, which led to the virtual abandonment of GSW. The joint airport proposal was revisited in 1961 after the Federal Aviation Administration (FAA) refused to invest more money in separate Dallas and Fort Worth airports. Although the Fort Worth airport was eventually abandoned, Dallas Love Field became congested and had no more room to expand. Following an order from the federal government in 1964 that it would unilaterally choose a site if the cities could not come to an agreement, officials from the two cities finally agreed on a location for a new regional airport that was north of the abandoned GSW and almost equidistant from the two city centers. The land was purchased by the cities in 1966 and construction began in 1969. Voters went to the polls in cities throughout the Dallas/Ft Worth area to approve the new North Texas Regional Airport, which was named after the North Texas Commission that was instrumental in the regional airport coming to fruition. The North Texas Commission formed the North Texas Airport Commission to oversee the planning and construction of the giant airport. Area voters approved the airport referendum and the new North Texas Regional Airport would become a reality. Under the original 1967 airport design, DFW was to have pier-shaped terminals perpendicular to a central highway. In 1968, the design was revised to provide for semicircular terminals, which served to isolate loading and unloading areas from the central highway, and to provide additional room for parking in the middle of each semicircle. The plan proposed thirteen such terminals, but only four were built initially. DFW held an open house and dedication ceremony on September 20–23, 1973, which included the first landing of a supersonic Concorde in the United States, an Air France aircraft en route from Caracas to Paris. The attendees at the airport's dedication included former Texas Governor John Connally, Transportation Secretary Claude Brinegar, U.S. Senator Lloyd Bentsen and Texas Governor Dolph Briscoe. The airport opened for commercial service as Dallas/Fort Worth Regional Airport on January 13, 1974, at a cost of $700 million. The first flight to land was American Airlines Flight 341 from New York, which had stopped in Memphis and Little Rock. The name change to Dallas/Fort Worth International did not occur until 1985. When it opened, DFW had four terminals, numbered 2W, 2E, 3E and 4E. During its first year of operations, the airport was served by American Airlines, Braniff International Airways, Continental Airlines, Delta Air Lines, Eastern Air Lines, Frontier Airlines, Ozark Air Lines, Rio Airways and Texas International Airlines. The Wright Amendment of 1979 banned long distance flights into Love Field, leaving Southwest Airlines as Love Field's only jet airline and operating solely as an intrastate air carrier in the state of Texas. Braniff International Airways was a major operator at DFW in the airport's early years, operating a hub from Terminal 2W with international flights to South America and Mexico from 1974, London from 1978 and Europe and Asia from 1979, before ceasing all operations in 1982. During the Braniff hub era, DFW was one of only four U.S. airports to have scheduled Concorde service; Braniff commenced scheduled Concorde service from Dallas to Washington from 1979 to 1980, using British Airways and Air France aircraft temporarily re-registered to Braniff while flying within the United States. British Airways later briefly flew Concorde to Dallas in 1988 as a substitute for its ordinarily scheduled DC-10 service. Following airline deregulation, American Airlines (which had already been one of the largest carriers serving the Dallas/Fort Worth area for many years) established its first hub at DFW on June 11, 1981. American finished moving its headquarters from Grand Prairie, Texas, to a building in Fort Worth located on the site of the old Greater Southwest Airport, near DFW Airport on January 17, 1983; the airline began leasing the facility from the airport, which owns the facility. By 1984, the American hub occupied most of Terminal 3E and part of Terminal 2E. American's hub grew to fill all of Terminal 2E by 1991. American also began long-haul international service from DFW, adding flights to London in 1982 and Tokyo in 1987. Delta Air Lines also built up a hub operation at DFW, which occupied most of Terminal 4E through the 1990s. The Delta hub peaked around 1991, when Delta had a 35% market share at DFW; its share was halved by 2004, after many of its mainline routes were downgraded to more frequent regional jet service in 2003. Delta closed its DFW hub in 2004 in a restructuring of the airline to avoid bankruptcy, cutting its DFW operation to only 21 flights a day from over 250 and redeploying aircraft to hubs in Cincinnati, Atlanta and Salt Lake City. Prior to the closure, Delta had a 17.3% market share at DFW. After the closing of Delta's hub, DFW offered incentives to Southwest Airlines to relocate its service to DFW from Love Field, but Southwest, as in the past, chose to stay at Love Field. In 1989 the airport authority announced plans to rebuild the existing terminals and add two runways. After an environmental impact study was released the following year, the cities of Irving, Euless and Grapevine sued the airport over its extension plans, a battle that was finally decided (in favor of the airport) by the US Supreme Court in 1994. The seventh runway opened in 1996. The four primary north–south runways (those closest to the terminals) were all lengthened from 11,388 feet (3,471 m) to their present length of 13,400 feet (4,084 m). The first, 17R/35L, was extended in 1996 (at the same time the new runway was constructed) and the other three (17C/35C, 18L/36R and 18R/36L) were extended in 2005. DFW is now the only airport in the world with 4 serviceable paved runways longer than 4,000 metres (13,123 ft). Terminal D, built for international flights, and DFW Skylink, a modern bidirectional people mover system, opened in 2005. From 2004 to 2012, DFW was one of two US Army "Personnel Assistance Points" which received US troops returning from wars in Iraq and Afghanistan for rest and recuperation. This ended on March 14, 2012, leaving Hartsfield–Jackson Atlanta International Airport as the sole Personnel Assistance Point. Airports Council International (ACI) named DFW Airport the best large airport with more than 40 million passengers in North America for passenger satisfaction in 2016. In June 2018, DFW Airport opened a fully functioning emergency room on airport grounds, located in Southgate Plaze near the Airport Headquarters and Rental Car Center. With this opening, the facility became the first actual ER on an airport's property anywhere around the globe. As DFW continues to see growth and set records, the airport is studying the possibility of a sixth terminal, to be known as Terminal F. It would tentatively be located directly south of Terminal D and across International Parkway from Terminal E, in the Express South parking lot. The Skylink was designed and built to accommodate Terminal F, as the track follows a roughly semicircular path over the parking lot, similar to its path through the other terminals. However, discussions are currently underway between the airport and its largest tenant, American Airlines, on whether to construct Terminal F as previously planned or construct an entirely new terminal layout. A Skylink train making a stop at Terminal E, next to a Spirit Airlines Airbus A320. Dallas/Fort Worth International Airport has five terminals and 165 gates. The airport is designed with expansion in mind and can theoretically accommodate up to thirteen terminals and 260 gates, although this level of expansion is unlikely to be reached in the foreseeable future. The first four terminals were designed by Hellmuth, Obata and Kassabaum and Brodsky, Hopf & Adler. The terminals at DFW are semicircular (except for the newest terminal, Terminal D, which is a "square U" shape) and built around the airport's central north–south arterial road, International Parkway. Until the late 1990s, they were designated by a number (2 being northernmost, 4 being southernmost) and a letter suffix ("E" for East, "W" for West). This system was later scrapped and the terminals are now lettered from A to E. Terminals A, C, and E (from north to south) are on the east side of the airport, while Terminals B and D (from north to south) are on the west side. DFW's terminals are designed to minimize the distance between a passenger's car and airplane, and to reduce traffic around terminals. A consequence of this layout is that connecting passengers had to walk extremely long distances between gates (in order to walk from one end of the semicircular concourse to the other, one must walk the entire length; there were no shortcuts or moving walkways between the ends). The original people mover train (Airtrans APM, later the American Airlines TrAAin) was notoriously slow (17 mph (27 km/h)), uni-directional (running only in a counter-clockwise direction) and was located outside the secured area (thus requiring travelers to go through security again). It was replaced by Skylink in April 2005 after serving approximately 250 million passengers. Skylink serves all five terminals at a considerably higher speed (up to 35 mph (56 km/h)), is bi-directional, and is located inside the secured area. Terminal Link connects all terminals with a shuttle bus system on the non-secure side. DFW Airport tentatively completed a $2.7 billion "Terminal Renewal and Improvement Program" (TRIP), which encompassed renovations of three of the original four terminals (A, B, and E). Work on the project began following the conclusion of Super Bowl XLV in February 2011. Terminal A was the first terminal to undergo these renovations which were completed in January 2017 at a cost of about $1 billion. This was followed by the completion of Terminal E in August 2017 and Terminal B in December 2017. While Terminal C was originally part of the multibillion-dollar renovations, American Airlines in 2014 asked to delay renovations of the terminal. Currently the fate of Terminal C is uncertain with the possible construction of the future Terminal F and American Airlines' need for gate space. Terminal A has 26 gates. Originally named "Terminal 2E", it is fully occupied by American Airlines for domestic flights and some international departures. Prior to the opening of Terminal D, Terminal A operated most of American Airlines' international flights at the airport. A satellite terminal near Terminal A was used due to gate restraints. Passengers were taken to the satellite via shuttle buses from gate A6. The satellite terminal was abandoned in 2005 when all American Eagle flights were consolidated into Terminals B and D. It now serves as a Corporate Aviation terminal for private and corporate aircraft, reopening in December 2010. As of January 2017, renovations in Terminal A are now completed. Terminal B has 47 gates. This terminal was called "Terminal 2W" when the airport was opened. It was occupied by Braniff International Airways, which was the largest carrier to open DFW in 1974. Braniff was its main occupant until May 1982. The Inter-Faith Chapel near United's former gates commemorates the airline. By the early 1990s, Terminal 2W housed most carriers other than American and Delta. Prior to the opening of Terminal D, all foreign flag carriers operated from this terminal. AirTran Airways, Frontier Airlines, Midwest Airlines, and US Airways (including the former America West Airlines) relocated to Terminal E in 2006. On December 13, 2009, United moved to Terminal E to join its new alliance (and later merger) partner Continental, at which point American Eagle became the sole operator in Terminal B. The terminal contains an American Airlines Admirals Club. Along with the TRIP improvements, a new 10-gate stinger concourse off of Terminal B was constructed between gates B28 and B33 to accommodate growth. The stinger concourse makes Terminal B the largest terminal at DFW in terms of number of gates. Terminal C has 28 gates. American Airlines operates all the gates at Terminal C, originally called "Terminal 3E", for only domestic flights. The terminal contains an American Airlines Admirals Club. The Hyatt Regency DFW Airport hotel is directly adjacent to this terminal. A twin hotel building stood across International Parkway but was demolished for the construction of Terminal D.
Terminal C has not started their TRIP Improvements. DFW Airport CEO Sean Donohue has been in talks with American about the future of Terminal C. They will either destroy it once the future Terminal F is finished, or renovate and keep it for other carriers to use so American and other airlines do not have to give up gate space. Terminal D has 28 gates. It is DFW's international terminal, capable of handling 32,000 passengers daily or 11.7 million passengers annually. The terminal features 200 ticketing positions and a federal inspection facility capable of processing 2,800 passengers per hour. The terminal officially opened on July 23, 2005. The eight-level parking garage has over 8,100 parking spaces and uses a Smart Technology System that lets guests know which floors are full. Air-conditioned skybridges with moving walkways and elevators connect the garage to the terminal, and an arrivals canopy roof shields pedestrians from inclement weather as they enter and exit the terminal. The 298-room Grand Hyatt DFW Hotel is directly connected to the terminal. In addition, Terminal D hosts a Minute Suites hotel located inside security. The terminal contains an American Airlines Admirals Club, a British Airways Lounge, a Korean Air Lounge, a Lufthansa Lounge, and a Qantas Business Lounge and an American Express Centurion Lounge. On May 7, 2014, Qantas announced an upgauge to A380 service beginning in September 2014, and the Airport announced that gates 15 and 16 were being renovated to accommodate the A380 in anticipation of the new service. Terminal D had been designed with the A380 in mind; however, loading the double-deck aircraft requires three gates with a separate jet bridge to serve first class and business class passengers on the upper level, so the renovations included the addition of gate 16X. On September 29, 2014, a Qantas A380–sporting a commemorative cowboy hat and bandana on the Kangaroo tail logo–inaugurated service at the remodeled gates. Qantas Flights 7 and 8 continue to use A380s and remain the longest non-stop flights to and from DFW Airport. Terminal E has 36 gates. Originally called Terminal 4E, it was occupied primarily by Delta Air Lines until Delta closed its hub in 2005 and retained only flights to its other hubs. Delta branded the terminal "Easy Street" and marketed this term to passengers. Today, the terminal is used by all U.S.-based carriers at the airport other than Sun Country, and by Air Canada Express USCBP precleared flights from Canada. Terminal E was formerly the only terminal at DFW in which American Airlines had no presence, but this changed after their merger with US Airways, when they combined gates. The terminal previously had customs facilities that were used when Delta operated flights to Frankfurt in the early 1990s, and when Air France and Aeroméxico used to serve DFW before the International Terminal D was constructed. In the 2000s, SkyTeam partner airlines Continental and Northwest moved to gates adjacent to Delta. Terminal E is connected to the other terminals by Skylink, but lacks a walkway to the other terminals. The terminal includes a Delta Sky Club as well as a United Club. Terminal E is distinctive in that it has a satellite terminal connected by an underground walkway. The satellite, opened in 1988 to accommodate Delta and was later used by Delta Connection. It was briefly used in 2009 to house federal workers who evacuated New Orleans International Airport during Hurricane Gustav. It was refurbished and reopened in 2013 to house US Airways and Spirit Airlines while Terminal E was renovated. In April 2018, DFW Airport and American Airlines announced a $20 million renovation to the satellite terminal, converting 9 existing mainline gates to 15 regional gates, along with updating interior fixtures such as carpet, elevators, escalators and moving walkways. American plans to have renovations completed and be fully moved into the terminal in Spring 2019. A consolidated rental car facility is located at the south end of the airport and connected to all terminals by a dedicated network of shuttle buses. Hosting ten rental car companies, the center was completed in March 2000. The DFW Airport area is served by International Parkway (partially State Highway 97 Spur), which runs through the center of the airport, connecting to Airport Freeway (State Highway 183) on the southern side of the airport and John W. Carpenter Freeway (State Highway 114) on the northern side. International Parkway continues north of State Highway 114, carrying the State Highway 121 designation for a short while until its interchange with the Lyndon B. Johnson Freeway (I-635), where State Highway 121 continues north as the Sam Rayburn Tollway. Dallas Area Rapid Transit offers bus service to Downtown Irving/Heritage Crossing Station and Southwestern Medical District/Parkland Station on route 408 from the Remote South Parking facility. DART operates light rail from DFW Airport station located at Terminal A. This provides direct rail service on the Orange Line to Dallas and Las Colinas (with a later extension to DFW Airport North station). TEXRail is a commuter rail service between Terminal B and T&P Station via Fort Worth Intermodal Transportation Center. DFW Airport is additionally served by the Trinity Railway Express commuter rail line at CentrePort/DFW Airport Station via shuttle bus to the Remote South parking lot. The line serves both downtown Dallas and downtown Fort Worth. The facility at 1639 West 23rd Street is located on the airport property and in the City of Grapevine. Tenants include China Airlines, Lufthansa Cargo, and the U.S. Fish and Wildlife Service. The DFW Airport Department of Public Safety provides the airport with its own police, fire protection, and emergency medical services. The DFW International Airport headquarters is located nearby at 2400 Aviation Drive, DFW Airport, TX 75261. In 1995, the airport opened Founders' Plaza, an observation park dedicated to the founders of DFW Airport. The site offered a panoramic view of the south end of the airport and hosted several significant events, including an employee memorial the day after the September 11, 2001, terrorist attacks and the airport's 30th anniversary celebration in 2004. As part of the perimeter taxiway project, Founders' Plaza was closed in 2007 and moved to a new location surrounding a 50-foot (15 m)-tall beacon on the north side of the airport in 2008. The 6-acre (2.4 ha) plaza features a granite monument and sculpture, post-mounted binoculars, piped-in voices of air traffic controllers and shade pavilions. In 2010, a memorial honoring Delta Air Lines Flight 191 was dedicated at the plaza. Since the opening of DFW in January 1974 through the end of 2018, nearly 2.077 billion passengers have flown in and out of the airport. This represents an average of over 46.15 million passengers annually. August 2, 1985: Delta Air Lines Flight 191, a Lockheed L-1011 on a Fort Lauderdale–Dallas/Fort Worth–Los Angeles route, crashed near the north end of runway 17R (now 17C) after encountering a severe microburst on final approach; the crash killed 8 of 11 crew members, 128 of 152 passengers on board and one person on the ground. March 24, 1987: The pilot of a Metroflight Convair CV-580, registration number N73107, operating for American Eagle Airlines on a commuter flight bound for Longview, lost directional control during a crosswind takeoff. The left-hand wing and propeller struck the runway and the nose landing gear collapsed as the craft slid off the runway and onto an adjacent taxiway; 8 passengers and 3 crew aboard the airliner suffered minor or no injuries. The crash was attributed to the pilot's decision to disregard wind information and take off in weather conditions that exceeded the rated capabilities of the aircraft; the pilot's "overconfidence in [his/her] personal ability" was cited as a contributing factor in the accident report. May 21, 1988: An American Airlines McDonnell Douglas DC-10-30, registration number N136AA, operating as AA Flight 70 bound for Frankfurt, overran runway 35L after automatic warning signals prompted the flight crew to attempt a rejected takeoff; the jetliner continued to accelerate for several seconds before slowing, and did not stop until it had run 1,100 feet (335 m) past the runway threshold, collapsing the nose landing gear. 2 crew were seriously injured and the remaining 12 crew and 240 passengers escaped safely; the aircraft was severely damaged and was written off. Investigators attributed the overrun to a shortcoming in the design standards that were used when the DC-10 was built; there had been no requirement to test whether partially worn (as opposed to brand-new) brake pads were capable of stopping the aircraft during a rejected takeoff and 8 of the 10 worn pad sets on N136AA had failed. August 31, 1988: Delta Air Lines Flight 1141, a Boeing 727 bound to Salt Lake City International Airport in Salt Lake City, Utah, crashed after takeoff from Dallas/Fort Worth Airport, killing 2 of 7 crew members and 12 of 101 passengers on board. April 14, 1993: The pilot of American Airlines Flight 102, a McDonnell Douglas DC-10-30, registration number N139AA, lost directional control during a crosswind landing in rainy conditions and caused the jetliner to slide off runway 17L after arriving from Honolulu, Hawaii. The craft dug into deep mud alongside the runway, collapsing the nose landing gear and tearing off the left-hand engine and much of the left wing. A fire in the left-hand wheel well was rapidly extinguished by firefighters who arrived almost immediately from the nearby DFW/DPS Fire Station. 2 passengers suffered serious injuries while using the evacuation slides to escape from the steeply tilted fuselage; the remaining 187 passengers and all 13 crew evacuated in relative safety, but the aircraft was a total loss. May 23, 2001: The right main landing gear of an American Airlines Fokker 100, registration number N1419D, operating as AA Flight 1107, collapsed upon landing on runway 17C after a scheduled flight from Charlotte/Douglas International Airport. The pilot was able to maintain directional control and bring the aircraft to a stop on the runway. The incident was attributed to metal fatigue caused by a manufacturing flaw in the right main gear's outer cylinder; there were no serious injuries to the 88 passengers or 4 crew, but the aircraft was written off. ^ Perryman, M. Ray (April 9, 2016). "In flight: The economic impact of DFW Airport". Fort Worth Business Journal. Retrieved January 2, 2018. ^ a b "Preliminary World Airport Traffic and Rankings 2013 – High Growth Dubai Moves Up to 7th Busiest Airport". Airports Council International. March 31, 2014. Retrieved August 26, 2015. ^ a b "dfwairport.com – Traffic Statistics". Retrieved March 19, 2016. ^ "Passenger Traffic 2010 FINAL". Airports Council International. Retrieved August 6, 2011. ^ FAA Airport Master Record for DFW (Form 5010 PDF), effective October 12, 2017. ^ "Contact Us". Dallas/Fort Worth International Airport. Retrieved July 6, 2012. ^ a b c d e f g DFW Airport (April 1, 2018). "DFW Airport By The Numbers" (PDF). Retrieved April 10, 2018. ^ Public Affairs Department (March 7, 2013). "DFW International Airport Reaches Milestone of 200 Nonstop Destinations In Its Mission to Connect The World" (Press release). Dallas/Fort Worth International Airport. Archived from the original on September 11, 2015. Retrieved August 26, 2015. ^ Freeman, Paul (January 27, 2012). "Texas – Northeast Fort Worth Area". Abandoned & Little-Known Airfields. Retrieved July 6, 2012. ^ "Our Future Hangs In The Balance – Two Mile Long Terminal Planned". Irving Daily News Special Supplement. Irving Daily News. June 4, 1967. ^ a b c Slotboom, Oscar (2013). Dallas-Fort Worth Freeways: Texas-Sized Ambition (PDF). ISBN 978-0-9741605-0-4. Archived from the original (PDF) on December 11, 2013. Retrieved December 6, 2013. ^ a b "Dallas Fort Worth International Airport". Texas State Historical Association. Retrieved December 4, 2013. ^ "Dallas – Ft. Worth Regional Airport" (JPG). Retrieved August 26, 2015. ^ Domeier, Doug (September 23, 1973). "Texas-Sized Airport Dedicated to Youth" (PDF). The Dallas Morning News. Archived from the original (PDF) on December 10, 2013. Retrieved December 6, 2013. ^ Ahles, Andrea (January 11, 2014). "40th anniversary: DFW ready to soar into the future". Fort Worth Star-Telegram. Retrieved January 2, 2018. ^ "DFW74intro". Retrieved March 19, 2016. ^ "Wright Amendment of 1979". Aviation Online Magazine. Archived from the original on June 9, 2011. Retrieved July 6, 2012. ^ "DAL79intro". Retrieved March 19, 2016. ^ Nance, John J. (1984). Splash of Colors The Self Destruction of Braniff International. New York: William Morrow and Company. pp. 80–83. ISBN 0-688-03586-8. ^ "History of American Airlines". American Airlines. Archived from the original on May 26, 2012. Retrieved July 6, 2012. ^ "American Airlines Finishes Moving into Headquarters Monday". Ocala Star-Banner. Associated Press. January 16, 1983. p. 6A. Retrieved July 6, 2012. . Retrieved on August 27, 2009. ^ a b "Dallas/Fort Worth Regional Airport, November 1984". DepartedFlights.com. Retrieved December 4, 2013. ^ a b "Dallas/Fort Worth International Airport, October 1991". DepartedFlights.com. Retrieved December 4, 2013. ^ "American Airlines Celebrates 25 Years of Service Between Dallas/Fort Worth and Japan" (Press release). American Airlines. PR Newswire. May 21, 2012. Retrieved August 30, 2013. ^ "D/FW braces for Delta restructuring". The Dallas Morning News. August 17, 2004. Retrieved December 10, 2013. ^ "Delta to cut 7,000 jobs, DFW hub". Associated Press. September 9, 2004. Archived from the original on December 12, 2013. Retrieved December 5, 2013. ^ Public Affairs Department (July 18, 2005). "DFW International Airport To Open International Terminal D on July 23" (PDF) (Press release). Dallas/Fort Worth International Airport. Archived from the original (PDF) on May 11, 2012. Retrieved August 6, 2011. ^ a b Public Affairs Department (May 21, 2005). "DFW International Airport Debuts Worlds Largest Airport People Mover System" (PDF) (Press release). Dallas/Fort Worth International Airport. Archived from the original (PDF) on July 3, 2015. Retrieved August 6, 2011. ^ Vaughn, Chris (January 23, 2012). "Soldier Stopovers at DFW Airport to End". Fort Worth Star-Telegram. Retrieved July 6, 2012. ^ "Best Airport by Size and Region". Airports Council International. Archived from the original on January 2, 2018. Retrieved January 2, 2018. ^ Unger, Todd (June 5, 2018). "DFW Airport gets a world first: A fully-staffed emergency room". WFAA. Retrieved December 7, 2018. ^ Public Affairs Department (July 17, 2003). "DFW International Airport Link Terminal D & Skylink Projects with "Golden Spike" Ceremony" (PDF) (Press release). Dallas/Fort Worth International Airport. Archived from the original (PDF) on May 13, 2016. Retrieved August 26, 2015. ^ Shine, Conor. "DFW Airport prepares for record growth as Terminal F decision looms". Retrieved 1 February 2019. ^ Public Affairs Department (June 21, 2005). "DFW International Airport Bids Farewell to Venerable Airport Train System – 97 Million Miles and 250 Million Passengers Later" (PDF) (Press release). Dallas/Fort Worth International Airport. Archived from the original (PDF) on May 11, 2012. Retrieved August 6, 2011. ^ "Terminal Link". Dallas/Fort Worth International Airport. Archived from the original on August 20, 2011. Retrieved August 6, 2011. ^ Ahles, Andrea (August 7, 2014). "DFW Airport increases terminal renovation project budget by $650 million to $2.7 billion". Fort Worth Star-Telegram. Archived from the original on October 17, 2015. Retrieved August 26, 2015. ^ Bouaphanh, Khampha (January 26, 2017). "$1 billion makeover at DFW Airport's Terminal A (finally) done". Fort Worth Star-Telegram. Retrieved March 31, 2018. ^ Ahles, Andrea (February 18, 2017). "DFW Airport delays renovations at Terminal C as American mulls needs". Fort Worth Star-Telegram. Retrieved March 31, 2018. ^ "Departures". DFW Airport. Retrieved 20 August 2017. ^ "DFW International Airport Opens New Corporate Aviation Facility in Anticipation of Super Bowl XLV". DFW Airport. December 20, 2010. Retrieved April 8, 2018. ^ "Dallas Fort Worth International Airport completes Terminal A renovations – Financial News". www.financial-news.co.uk. Retrieved November 2, 2017. ^ "DFW91". www.departedflights.com. Retrieved 2018-03-26. ^ "Terminal B Stinger Building Presentation" (PDF). Dallas/Fort Worth International Airport. Archived from the original (PDF) on July 27, 2013. Retrieved October 1, 2013. ^ "Dykon Blasting Hyatt Regency Implosion DFW Airport". Archived from the original on March 11, 2008. Retrieved January 22, 2013. ^ "DFW Airport delays renovations at Terminal C as American mulls needs". star-telegram. Retrieved 2017-03-20. ^ Public Affairs Department (July 18, 2005). "DFW International Airport to Open International Terminal D on July 23" (PDF) (Press release). Dallas/Fort Worth International Airport. Archived from the original (PDF) on October 21, 2012. Retrieved January 23, 2013. ^ "Minute Suites DFW website". Archived from the original on December 26, 2016. Retrieved December 26, 2016. ^ Maxon, Terry (May 7, 2014). "Qantas will begin flying the Airbus A380 to Dallas/Fort Worth in late September". The Dallas Morning News. Retrieved September 29, 2014. ^ a b Public Affairs Department (May 7, 2014). "Qantas Airways To Upgrade DFW Australia Service to Airbus A380, The World's Largest Passenger Jet" (Press release). Dallas/Fort Worth International Airport. Archived from the original on October 6, 2014. Retrieved September 29, 2014. ^ a b Sakelaris, Nicholas (September 29, 2014). "D/FW to Sydney: Qantas introduces giant A380 for world's longest scheduled flight". Dallas Business Journal. Retrieved September 30, 2014. ^ Maxon, Terry (September 29, 2014). "Qantas Airways parks its Airbus A380 at Dallas/Fort Worth International Airport". The Dallas Morning News. Retrieved September 29, 2014. ^ "Delta to Revise Print Advertisement". The Dallas Morning News. March 8, 1991. Retrieved July 6, 2012. ^ Maxon, Terry (July 28, 2012). "D/FW Airport prepares to reopen old Delta satellite as it remodels Terminal E". the Dallas Morning News. Retrieved December 5, 2013. ^ Public Affairs Department (October 24, 2012). "DFW International Airport Reopens Terminal E Satellite As Transition Space for Airlines During Terminal Renewal" (Press release). Dallas/Fort Worth International Airport. Archived from the original on October 17, 2015. Retrieved August 26, 2015. ^ Shine, Connor (April 6, 2018). "American Airlines adding 15 regional gates at DFW Airport's Terminal E satellite". Dallas Morning News. Retrieved April 8, 2018. ^ "Rental Cars". Dallas/Fort Worth International Airport. Retrieved August 26, 2015. ^ "PGAL Dallas/Fort Worth International Airport Consolidated Rental Car Facility (ConRAC) and Bus Maintenance Facility". PGAL. Archived from the original on July 23, 2015. Retrieved August 26, 2015. ^ Gubbin, Teresa (March 25, 2015). "DART to DFW Airport route busts out early". CultureMap. Dallas, Texas. Retrieved August 26, 2015. ^ "2010 Zoning Maps". City of Grapevine. Archived from the original on November 18, 2011. Retrieved November 17, 2011. ^ "Tax Maps". City of Grapevine. Archived from the original on November 18, 2011. Retrieved July 16, 2012. ^ " "Wildlife Inspector-Dallas/Fort Worth Airport, Texas". U.S. Fish and Wildlife Service. Retrieved November 17, 2011. ^ "DPS Home". Dallas/Fort Worth International Airport. Retrieved August 26, 2015. ^ "DFW International Airport Headquarters". Dallas/Fort Worth International Airport. Retrieved July 5, 2018. ^ Public Affairs Department (August 27, 2008). "DFW International Airport Announces September 17 Grand Reopening of Founders Plaza" (PDF). Dallas/Fort Worth International Airport (Press release). Archived from the original (PDF) on May 11, 2012. Retrieved August 6, 2011. ^ Young, Michael E. (July 29, 2010). "DFW Airport to Dedicate Marker to 1985 Crash of Delta Flight 191". The Dallas Morning News. Retrieved August 6, 2011. ^ "Flight Schedule". Retrieved 4 March 2018. ^ "Flight Schedules". Retrieved 4 March 2018. ^ "Air France returning to Dallas/Fort Worth for first time since 2001". USA TODAY. ^ "Flight Timetable". Retrieved 4 March 2018. ^ a b Shine, Conor (August 21, 2019). "Planning a European vacation? DFW Airport will have two new route options next summer". Dallas Morning News. Retrieved August 21, 2018. ^ a b "American Airlines Enhances 2019 Schedule". news.aa.com. ^ "American Airlines adds another Caribbean destination from DFW just in time for summer". Dallas News. January 23, 2019. ^ a b "Flight schedules and notifications". Retrieved 4 March 2018. ^ a b c "American Airlines to add 18 routes, including new flights to Glacier National Park". USAToday. December 13, 2018. Retrieved December 13, 2018. ^ "Check itineraries". Retrieved 4 March 2018. ^ "Route Map and Schedule". Retrieved 4 March 2018. ^ "British Airways - Timetables". Retrieved 4 March 2018. ^ a b "FLIGHT SCHEDULES". Retrieved 4 March 2018. ^ "Frontier Airlines Kicks Off New Year with 22 New Routes". Frontier Airlines Kicks Off New Year with 22 New Routes. ^ Ltd. 2019, UBM (UK). "Frontier Airlines schedules new routes in April/May 2019". Routesonline. ^ "Frontier Airlines Continues to Add New Routes for Summer". Frontier Airlines Continues to Add New Routes for Summer. ^ "Frontier". Retrieved 4 March 2018. ^ "Japan Airlines Timetables". Retrieved 4 March 2018. ^ "JetBlue Airlines Timetable". Retrieved 4 March 2018. ^ "Qantas Timetables". Retrieved 4 March 2018. ^ "Destinations". Retrieved 4 March 2018. ^ "Where We Fly". Spirit Airlines. Retrieved 4 March 2018. ^ a b "2019-1-8 Press Release | SUN COUNTRY AIRLINES ANNOUNCES 19 NEW NONSTOP ROUTES". www.suncountry.com. ^ "Sun Country Airlines". Retrieved 4 March 2018. ^ a b "Timetable". Retrieved 4 March 2018. ^ "Volaris Flight Schedule". Retrieved 4 March 2018. ^ "Press Release – Qatar Airways". Qatar Airways. March 19, 2016. Retrieved March 19, 2016. ^ "DFW Airport Welcomes Freighter Service From Qatar Airways Cargo". CBS Dallas / Fort Worth. March 19, 2016. Retrieved March 19, 2016. ^ "RITA – BTS – Transtats". Retrieved June 2, 2018. ^ "Dallas/Fort Worth, TX: Dallas/Fort Worth International (DFW)". Bureau of Transportation Statistics. U.S. Department of Transportation. Retrieved 12 July 2017. ^ Dallas/Fort Worth Airport 1974-1981 Annual Traffic (Report). Provided by DFW Airport via email. ^ "NTSB Brief of Accident FTW87FA080" (PDF). National Transportation Safety Board. Retrieved May 31, 2012. 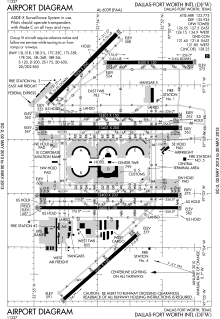 ^ "ASN Accident Description". Aviation Safety Network. Retrieved May 31, 2011. ^ St. Pierre, Nancy; Box, Terry; Lincoln Michel, Karen; Freedenthal, Stacey (April 15, 1993). "30 Hurt After Jet Slides Off Runway – Passengers Injured During Exit on Escape Chutes". The Dallas Morning News. Retrieved May 31, 2012.